The Third Sunday of Easter ~ April 19, 2015 – Rev. Canon Dr. William J. Danaher Jr.
Rev. Canon William J. Danaher Jr.
Today I’ve put a picture in your bulletin of a painting by Salvador Dali. 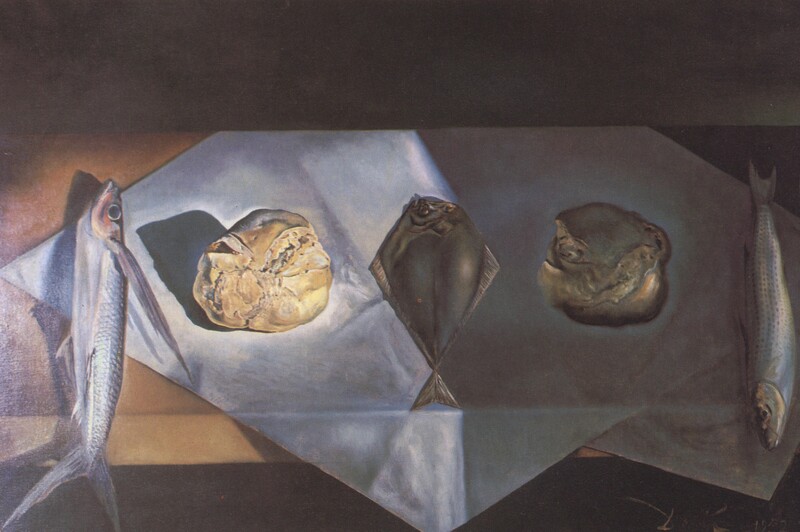 Its title is Nature Morte Evangélique, which means “Eucharistic Still Life.” Dali completed it in 1952, and it reflects an important transition in his career. In the early 20th-century, he had been known for his works of surrealism, and he was one of the originators of this movement. Surrealists painted images of an altered reality in order to expose the different ruptures and inconsistencies lying beneath the surface of everyday life. They were inspired by Sigmund Freud’s concept of the unconscious. Freud argued that our psyche was layered and complex, which means that we are unaware of our true motivations when we think or act. Therefore, one reason that Dali painted an image of a melting clock was to show the elasticity and plasticity of memory in our minds. Our memories do not reflect a time past, but the effect of the past on our present consciousness. However, in 1940, Dali fled Europe to escape World War II and went to the United States. He re-affiliated with the Roman Catholic Church, and, eventually, he and his lover, Gala, were married by a priest in1957. This return to the religion of his youth proved enduring. Dali became increasingly devout towards his life, despite a rather interesting personal life and despite a rather exciting social life. He was also profoundly affected by the dawn of the nuclear age. Once the atom bomb was dropped on Hiroshima, Dali began to think differently about the world. He believed that the nuclear age marked a turning point – now, no one can argue the point that we are complex beings inhabiting a complex universe in which things hold together by a strange kind of coherence. Matter and space, for example, are not things that you can cut a line through and divide easily. Rather, each piece of matter was itself a bundle of relations. Indeed, pinpointing where a particular particle was in terms of its exact position in time and space was impossible. Accordingly, just before he paints this picture Dali wrote that, where his former father had been Sigmund Freud, his new father was Werner Heisenberg, whose principle of uncertainty inspired him. Dali called this movement that he developed “nuclear mysticism”, and it represented the attempt to see reality in all of its complexity. Where in surrealism tried to bring to the surface all of the chaos that lies below the awareness people have of their own consciousness, in nuclear mysticism the challenge was to find images of order, truth and beauty in the universe we inhabit. For Dali, “reality” was best defined in terms of the order, beauty and truth we discover in our very beautiful, but dangerous, universe. To advance in this mysticism, Dali returned to the traditional practices of The Renaissance, and this painting is one of his early attempts to incorporate some of its rules. You’ll see in it the golden rule, the traditional way that artists established perspective and order. The fish at the middle of the painting creates a triangular shape that is replicated throughout the painting at a larger and larger scale. The realism of the painting is meant to communicate the point that when we discover this order and beauty and truth in the world, that it has its own legitimacy and power. And finally, the aesthetic, the philosophy of beauty that’s operating here is not simplicity, but complementarity. What makes this painting beautiful is not that there is a single point of integration, but that all of the elements depicted in it cohere and complement each other. And finally, what’s important about this painting is that it is Dali’s witness to the truth of Christianity as it is found in the Eucharist. Dali’s return to the traditions of the Renaissance was not merely motivated by its emphasis on realism. The Renaissance was, at its core, a religious movement, inspired by the Christian doctrine of the resurrection. “Renaissance” is French for “rebirth,” as many have noted. But the dynamic that inspired the movement’s renewed emphasis on painting bodies more accurately was to portray the effects of the resurrection in the reconciliation of all things more vividly and truthfully. Therefore, Dali’s painting is powerful because, at a deeper level, it is operating with an account of the resurrection that is fuller than what we see in other places. Here, he presents the mystery of Christianity as God’s reconciliation entering time and space. Dali’s painting goes with the grain of what Christians proclaim about the resurrection of Jesus. Jesus Christ is God’s reconciliation entering time and space. But he also makes a statement about the “three bodies” of Christ that we experience as Christians. Now that Jesus has been raised from the dead, his historical body has now ascended and He’s seated at the Father’s right hand. His ministry, so generations of Christians believe, is to intercede for us. Jesus is praying for us every moment of every day, praying for the church. However, we also see Jesus today in the Eucharist, when we receive the body and blood of Christ. Finally, because we have been joined together in Christ’s body through baptism, we encounter the body of Christ in each other. The Christ we meet is the Christ we see in each other’s faces. Dali’s painting is in some ways the perfect match of science and religion. For Dali, science and religion to have a complementary relationship and not a contested relationship. Science tells us that paintings are always changing at a subatomic level, that you and I are always changing at a subatomic level. Our faith teaches us that, when we encounter each other, when we participate in the Eucharist, we are also being changed on a spiritual level. Therefore, what we proclaim by faith in some ways goes with the grain of the universe. Dali’s painting also identifies an important teaching of the resurrection as a truly kinetic belief. The purpose of the resurrection is not to issue a ticket or promise or prize that one might get for being good. The resurrection is not a trick Jesus performed so that we would be cowed into belief. Rather, the resurrection begins today in our midst when you and I continue to be God’s reconciliation in time and space. And that’s good news. That’s why we read, for example, in our reading from 1 John today, “we are God’s children now; what we will be has not yet been revealed. What we do know is this: when he is revealed, we will be like him, for we will see him as he is.” The resurrection, in other words, still lies ahead for us as much as it lies within our midst. The challenge you and I have to face is to ask ourselves how can we lean into this emerging reality? How can we be God’s reconciliation in time and space? Finally, I picked on this painting by Dali because it’s one of the most beautiful depictions of our reading today from the Gospel of Luke. Here, Jesus appears to his disciples and says, “Peace.” He enters their midst, and they’re afraid He’s a ghost. He says, “Have you anything to eat?” He picks a piece of broiled fish and eats it to prove to His disciples that He is flesh and blood, that God’s reconciliation is like the new creation God breathed into existence when he formed humanity on the first day as body and soul. The resurrected Jesus is a reconciled soul and body, just as you and I are a soul and body. So when Jesus eats this fish in today’s gospel, it’s meant to signal to readers that we are witnessing a moment of grace. To have fish is to be blessed. Remember, the disciples were fishermen. To catch a fish is to be blessed, to be a recipient of grace, to be given something that not everybody gets even if they work hard. And so when Jesus eats this fish, He reveals the power of this grace once again. This is why, in the early church, the Eucharist was not depicted as a meal of bread and wine, but of bread and fish. Dali paints this painting because he wants to bear witness to the body of Christ. The bread and the wine you and I are about to share will change us not only on a subatomic level but on a spiritual level. It will represent again the promise that you and I are members together of the body of Christ. Therefore, in one sense, this painting is a mirror, showing us who we are most truly. So may we be. Amen. Basarab Nicholescu, From Modernity to Cosmodernity: Science, Culture, and Spirituality (Albany: State University of New York Press, 2014).